When it comes to harvesting asparagus, pay close attention to the appearance of the spears. They should be 6-9 inches long and have tight or closely wrapped tips. As time passes, the tips will begin to loosen and open up. When this happens, the asparagus spears become tough and develop a wood-like texture. If you wait too long and find some spears with loose tips, simply snap them off and throw them in the compost pile. When harvesting asparagus, use your fingers to snap off each spear near soil level. The stub that is left will dry up and begin to decompose. Some people prefer to use a knife and cut the spears an inch or two below the soil. This method works fine, but it's possible that while cutting a spear, you may inadvertently damage other buds on the crown because they are buried in the soil and are not visible. If you avoid using a knife, you can be sure not to damage the developing buds. The diameter of the spear does not dictate how tender it is. Don't be fooled into thinking that a fat spear will be tougher than a thin one. As long as the tips are closed and tight, the spear will be tender. You should not begin to harvest asparagus until at least the year after you plant it. This will mean more production of buds on the crown, which will lead to greater asparagus yields in the years to come. Asparagus spears typically begin to show when soil temperatures reach approximately 50 degrees F. Their rate of growth after emerging depends on the temperature of the air. The higher the air temperature, the more quickly the spears will grow and the greater the frequency that they will be ready for harvest. 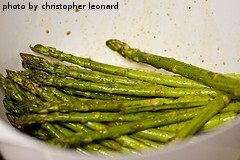 Depending on your geographic area, asparagus is usually ready to be harvested in May and June. Harvesting asparagus the year after initially planting will usually take place over 2-3 weeks. Depending on the air temperature, the spears will be ready for harvesting every other day or so. 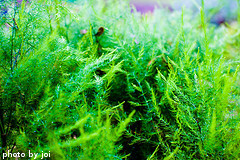 You should check the plants every day to make sure the tips aren't starting to loosen up. 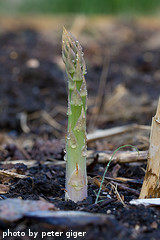 After a couple of years of being in the ground, your asparagus plants will produce edible spears for up to two months. Store the harvested spears by wrapping them in a damp paper towel or an open plastic bag and placing them in a refrigerator. They will keep for up to 4 days. Be sure not to use a sealed bag as the build up of gases will cause the asparagus spears to spoil faster. Asparagus spears can also be frozen. Blanche the spears in boiling water for 3 minutes and then immerse in ice water for several minutes to help retain the color. The spears can then be placed in an air-tight bag and placed in the freezer. They will last 3-6 months. It's time to stop harvesting asparagus when most of the spears fail to reach 1/4 inch in diameter (about the thickness of a pencil). When you reach this point, stop harvesting and let the remaining spear tips open up. Large ferns will grow from the remaining spears. These ferns will use photosynthesis to provide food for the plant that will lead a large harvest again the following year. After the first freeze and when the ferns turn completely brown, mow or cut down the entire asparagus patch as close to soil level as possible. Place the dead foliage and stalks in your compost pile or discard them. Like other perennial plants, the asparagus will go dormant and will re-emerge the following spring, stronger than ever.